We live in a day when most people, Christians included, eagerly apply for what God calls a curse - debt - but never give a second thought to preventing or even destroying what God calls a blessing - children. If we are to live our lives according to the Word of God, we must ask ourselves, "What saith the Scripture?" Join the Moore family in this timely documentary as they briefly expose the evil history of the birth control movement on the 50th anniversary of "the pill." Listen as they transparently share their testimony of how God, in His grace and mercy, opened their eyes in spite of their own sinful beginning. Be encouraged as they casually answer questions often posed to large families. Then, experience the joy of Biblical family life as they anticipate, give birth to, and welcome their tenth child into their home. Most of all, be inspired to look to the Word of God for answers to everything in life, but specifically to see that Children are a Blessing. "What a blessing to watch this movie! So often, when you see a large, God-honoring family, you mistakenly think things such as, "They've probably always made the right choices. They wouldn't understand the sinful choices I've made." Yet, nothing is farther from the truth with the Moore family. With such refreshing honesty, the Moore's open their lives to reveal the painful choices of their past while also revealing the mercy of our Lord and how He brings beauty from the ashes. With a wonderful Scriptural foundation, the movie takes you into the very heart of the Moore family, allowing you a glimpse into the lives of a family that seeks to honor and trust the Lord, acknowledging Him as sovereign over all. After we watched the film, my husband I remarked that we wished we had seen this film 15 years ago, when we first married. We were especially excited for our children to also watch this movie, giving them a glimpse into the beauty of God's plan and His delight in children. It has been encouraging to listen to our sons (ages 11 and 13) talk about the movie, realizing how this film has impacted their view of "children are a blessing." Thank you, Moore family, for inviting us into your sweet home and encouraging us, by your honest and humble example, to walk in the fullness of the Lord and His blessings. Your movie, will, without doubt, be life-changing for many! We rejoice knowing the number of precious children who will be born as a result of your God-honoring efforts." "Even if you are already solid in your views of children as a blessing, you will be blown away by this DVD! It will renew your vision and make you truly excited about your family and it's future. Getting to know this sweet family will bless you in an amazing way. It is an incredibly professionally made film, and as much as I was blown away by the quality, the content is what touched my heart and fueled my passion. This film could change your life." What a Blessing to Watch! "When we got our DVD in the mail, we couldn't wait to watch it and watched it right away. We were truly blessed by seeing just how much the Moore's have embraced God's vision for the family and we enjoyed seeing how much the whole entire family was so excited and looking forward to the birth of their tenth child. I (Melissa) was brought to tears when I saw baby Dabney born because my daughter Hayleigh which is due in only a few weeks is our first (and hopefully not the last) reversal baby. She wouldn't be here if God hadn't used people like the Moore's several years ago to speak the truth in love and convict us and show us God's vision for the family and that children truly are a blessing and a gift from God, not something to be prevented. We only wish we had watched something like this years ago before my husband had surgery to prevent more children. I really enjoyed the bonus features on the DVD and seeing how well all their children got along and how thankful they were to be in a large family and have so many brothers and sisters. You don't hear people saying that much these days. I also really enjoyed the question and answer session on the bonus features and how very balanced the Moore's were in their answers. My husband really appreciated how they didn't try to come off as super-spiritual or better than others because of their beliefs, but that they humbly admitted they only think this way because God changed their hearts. They weren't preachy or over-the-top but very humble and simply shared what God had shared with them in His Word and how God had convicted them in how they used to view children and having more. This DVD would be a great way to share how children are truly a blessing, with friends, family, or fellow church members because of their non in-the-face approach to what the Bible says. There were so many other wonderful things I could say about this DVD, but I don't want to give away too much of the content. You'll just have to get the DVD for yourself! : )"
"Our family watched a new DVD together the other night. It was such a blessing! 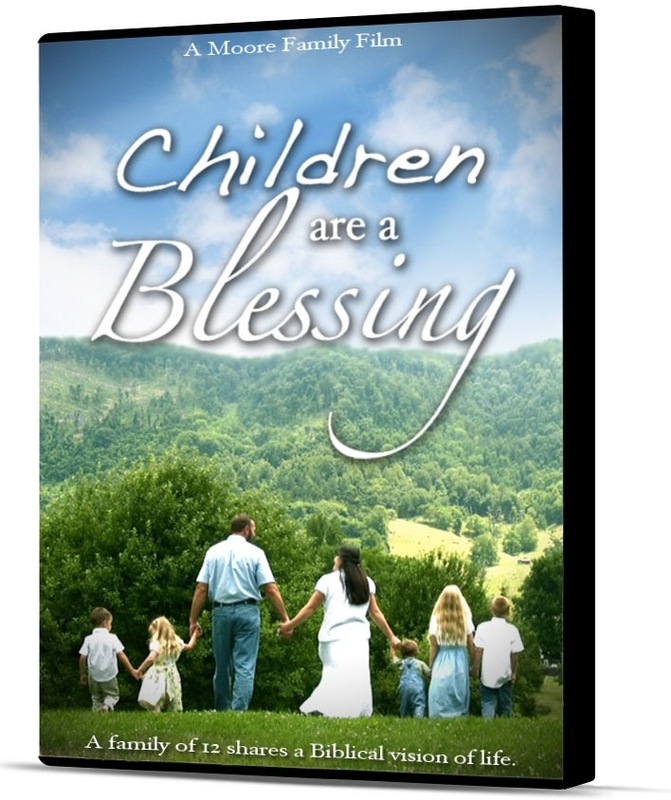 Produced by a sweet family in Virginia, titled "Children are a Blessing." They give you statistics, quotes and the history of birth control. It's a real education. But also much more than that...Their children are best friends with each other and their family is happy and joyful. You will enjoy just stepping into their lives for a brief hour. And if you ever doubted God's plan for your family, you will come away with renewed conviction! I highly recommend this film to everyone!" What a wonderful message. Thank you for this video! =) We have four children and pray for more. Is it easy? No, but God helps those who ask. Praise the Lord!